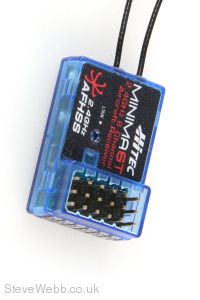 Utilizing Hitec’s advanced 2.4GHz AFHSS technology, the Minima 6T full-range micro receiver is an excellent choice for modellers flying smaller aircraft. The Minima 6T utilizes a top-pin configurations and features Hitec’s exclusive, dual-diversity Mini Boosted Omni-Directional Antenna (M-BODA). Dimensions - 1.22 x 0.82 x 0.28 in.